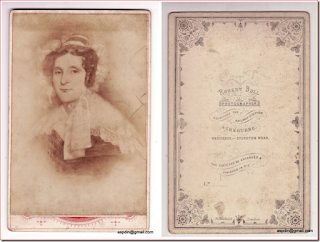 Nigel Aspdin (Derby,UK) Notes and Queries: Amelia Harlow nee Wyatt 1783-1853, wife of Robert Harlow 1779-1828. 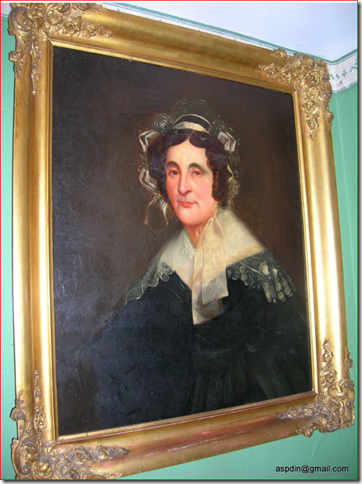 Amelia Harlow nee Wyatt 1783-1853, wife of Robert Harlow 1779-1828. 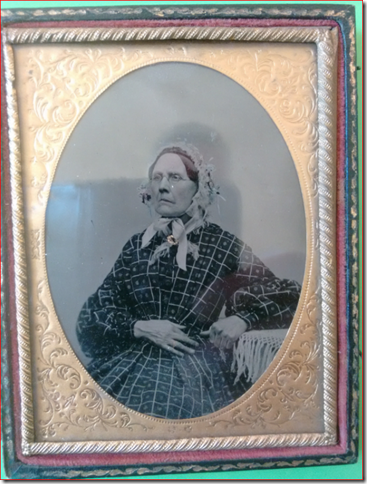 Whilst writing I attach another image which I currently believe to be Amelia Harlow nee Wyatt 1783-1853, wife of Robert Harlow 1779-1828. Its an ambrotype. She died in 1853 aged 70. Ambrotypes first appeared in the early 1850s so she was just in time to have an image done aged say 67-70. This woman does look that age. Ambrotypes rarely have any clue to photographer/studio unless a label is inside the case, the side holding the image, in this case none. She also does not fit any other person of the period I am likely to have inherited via my Ashbourne/Barnes roots.The image came to me also with an image of Thomas Barnes (her son in law) and the silhouettes. A better image will be available for your files when firmer conclusions are reached. If it is Amelia Harlow nee Wyatt 1783-1853, wife of Robert Harlow 1779-1828 we also have to match it with these images also thought to be her. Bear in mind that the one that is a cabinet card may not be a photo at all, it may be from a sketch when she was younger touched up by Robert Bull of Ashbourne, and the oil painting may also have been commissioned after her death from a drawing or from the oil painting. It is less likely that the Robert Bull cabinet card is done from the oil painting in my view. from which the following details are an extract courtesy of Brett Payne author of that site: Robert Bull was born c. 1839 at Ashbourne, Derbyshire, the third of six children (and eldest son) of Robert Fletcher Bull senior (c. 1807-1886) and his wife Helen (c. 1811-1857), a joiner, cabinet maker and builder from nearby Compton. As a young man he followed his father - and grandfather before him - into the carpentry trade, and was listed with his younger brother Henry as a "joiner & cabinet maker" in the April 1871 Census. By 1874 however, when Wright's trade directory gave the listing, "Bull Rt. joiner and bldr, and newsagt, Sturston rd. Ashbourne", they had obviously opened up a shop. Adamson (1997) shows Robert Bull, presumably Robert junior, working from premises in Sturston road from 1876 to 1878, so he seems to have started the photographic sideline in 1876. 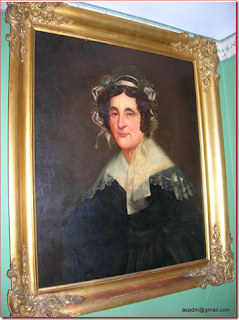 Hannah Holmes born 1748 or 1749 at Duffield, nr Derby. There are two christenings, do not know which one is her, but fromher age at death gives 1747. Married John Howard 31 July 1768 at Ashbourne. She would be 20, he 33 from age at death, cannot find his birth. They had John (b1769-d 1792) & Benjamin (b1772-d1807, brazier in his will, but not seen this). Married for 28 yrs until John Howard buried 6 Oct 1796, aged 61, brazier (Derby Mercury). Hannah Harlow buried 7 Jan 1825 aged 78. I suspect that John Howard (& his son Ben) were Harlow employees, so Sam married the widow of one of his workers. I enjoy family history, local history and occasional blogging relating to my interests, and can become interested in just about anything my mind or the internet takes me to. I enjoy collecting and flying flags, amongst other things, I have about 150 now. The hobby is called vexicology, but it is such a mouthful, and my knowledge is modest, so I do not refer to myself as a vexicologist ! My blog "What is that flag?" aims to guide the local residents and office workers who often stop me to ask what flag I am flying by my house in Vernon Street, Derby, each day. Please do not assume this blog or any of my blogging is in any way authoritative. I am using text and information from sites I trust and normally find sufficiently accurate, and I use my common sense. In flag blogging there are certainly often inaccuracies as to the precise shades of colour in some of the images, and in the proportions of the flags. In my blogging for 'Sepia Saturday' there may be flippant, intended to be humorous, inaccuracies sometimes.